iDatabase makes it easy for everyone to create and manage collections, inventories, lists and databases thanks to a novel user experience for this type of application. iDatabase is ideal for those who want to organise and quickly look up useful information for work or leisure. 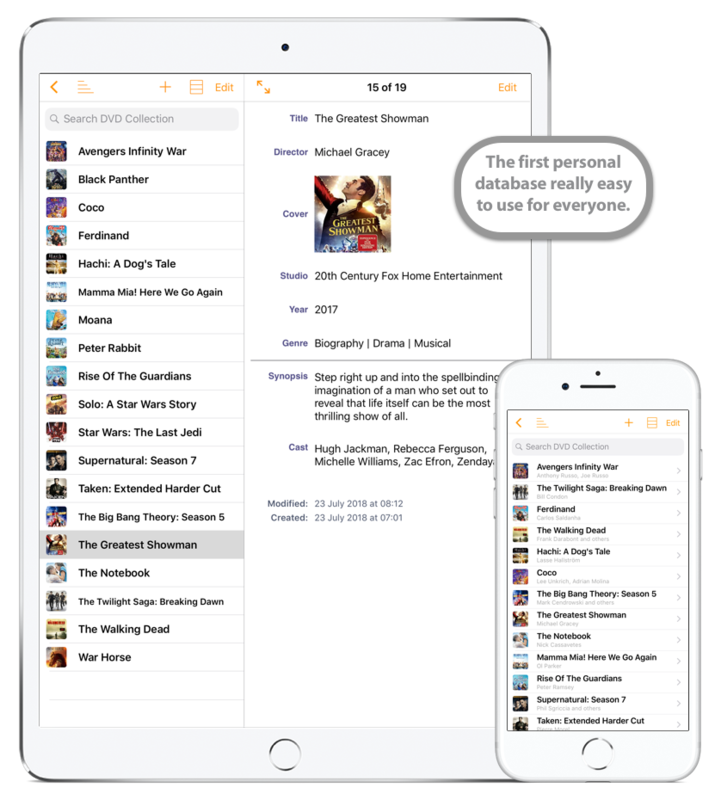 iDatabase for iPhone and iPad offers the easiest way to organise information, manage membership lists, expenses, projects, keep track of your internet passwords and much more. Create collections and inventories with a tap. Without having any previous experience with databases, you can use the included templates to quickly create and customise databases containing inventories, membership lists, expenses, projects, recipes and much more! You can choose from 22 ready-to-use templates and customise them to organise all types of information: CD collections, DVD collections, Discs, My Accounts, Courses, Computers, Contacts, Customers, Events, Diary exercises, Expenses, Inventory, Film catalogues, Membership lists, Mobile phones, Notes, Projects, Recipes, Things to do, Car maintenance, Animals and Books. You can also easily exchange templates with other iDatabase users via email. Type what you are looking for and let the app do the work for you. Are you looking for a contact, a book, your account details or a link stored in one of your database? No problem, type what you are looking for in the search field and let the app do the work for you. iDatabase can help you, even if you prefer to see the data by scrolling through. In a flash, you can sort the data by any field, and finally, if you share the device with your colleagues or family, or travel around the world and want to keep your personal information away from prying eyes, you can set a 4-digit PIN to prevent unauthorised access. Carry everything in your pocket. With iDatabase, you have a large number of different fields to enter your information. Store text, images, links, passwords, phone numbers and arithmetic operations so easily that it is amazing. You can manage your CD collection, store the passwords of your accounts, create an address book containing contact information for your customers or friends, and much more. iDatabase lets you carry everything in your pocket! Store your data in 14 different types of fields. 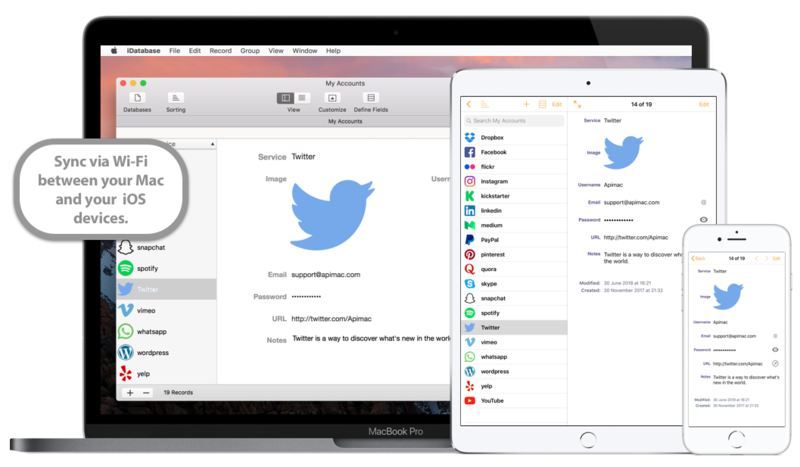 Store and retrieve all your important databases in your Dropbox space. Data loss is a thing of the past with iDatabase and its built-in backup function. You can store and retrieve all your important databases in your Dropbox space – just a tap. 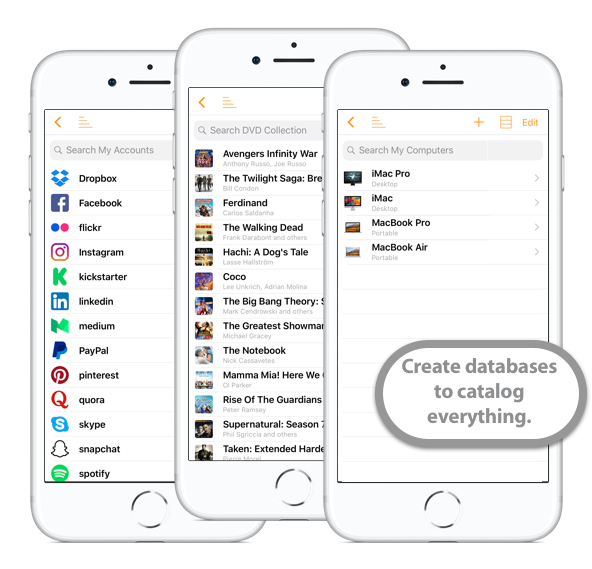 Have you ever dreamed of keeping the databases you have on your iPhone synchronized with those you have on your Mac? If you also own iDatabase for Mac, you can do it with Wi-Fi Sync. Another great feature is the ability to share your work with friends and colleagues via email, in several formats. 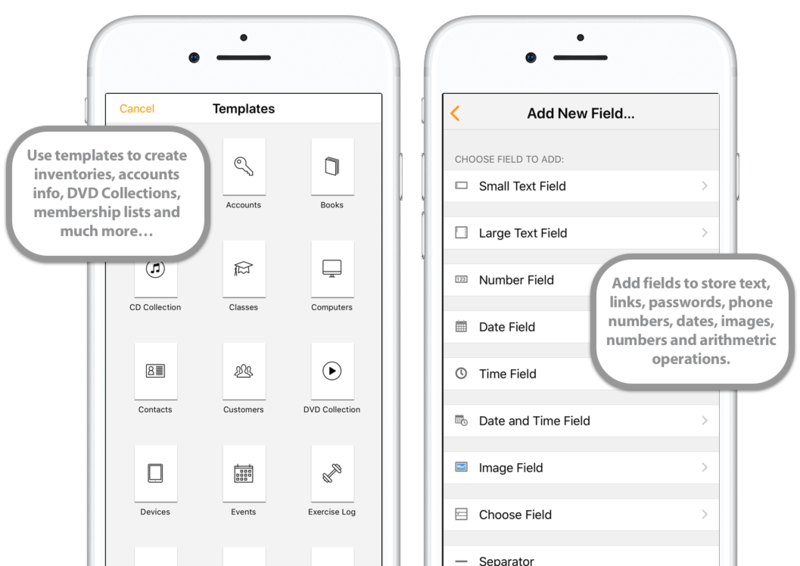 When you receive the file, you can import data immediately into the iDatabase iPhone or Mac!